Tonight was the final Council meeting before the election. I’ve attended every Council meeting this Fall except the special Friday morning one. I go to quite a few Council meetings in general, so attending this Fall’s during my run for office was not much of a stretch. Penny Rich and Augustus Cho usually show up to catch what’s going on directly (Augustus was there this evening, Penny was participating in UNC Healthcare’s Tickled Pink event to benefit cancer research). Watching the meeting on TV or via the Web is just not quite the same. Over the last eight years it has been interesting to see which candidates do show up – it seems like you would want to make sure you really want the job given the time commitment, to get up to speed on the relevant issues so you can hit the ground running, to learn a bit more of the nuts-n-bolts of how the Council operates so you can fit into the process fairly quickly – yet cycle after cycle it’s only a few that show. While the media will probably focus on the Kidzu presentation, the approval moving Glen Lennox’s neighborhood conservation district (NCD) forward, Jim – on election eve – asking the Town to enforce Northside’s NCD (which I talk about in my recent brochure) or Council letting their next incarnation decide on Strom’s replacement, probably the most consequential issue on tonight’s agenda will not get word one. Ken Pennoyer, the Town’s director of business management, was proposing a change in the structure of staff benefits. 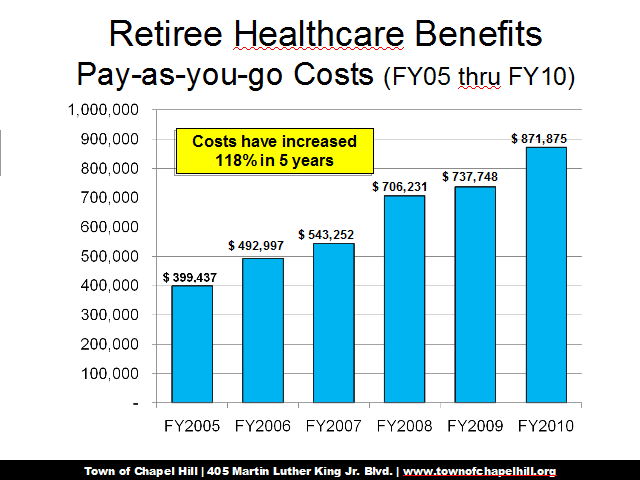 All new employees hired after June 30th, 2010 would get a defined benefit plan covering retirement health coverage. Existing employees would retain their Town guaranteed benefit, the payout based on term of service and retirement age. The existing plan, which is a “pay as you go” approach paid out of general revenues, has increased from $400K to $891k in 5 years – more than doubling our current obligation. To fully fund our commitment to our retired workforce would take $32M to $56M, roughly $3+ M or more per year, for a couple decades! While the Town has set aside $400K in designated funds over the last two years, the forward obligation makes those contributions pale in comparison. $3-4M per year is equivalent to $0.05 to $0.07 of Chapel Hill’s tax rate – an additional $150 to $210 per year on a $300K home tax bill. This unfunded liability is just one of a number of other obligations – like the $3M affordable housing maintenance fund – which has been allowed to grow and grow over the last 6 years. Tonight is the first attempt to truly grapple with that overhanging debt to our valued retirees. There are risks inherent in moving new employees to a defined benefit plan but the alternative, scrambling to find funds each fiscal cycle to adequately maintain that obligation, is not sustainable. I first met Rev. Robert Campbell, an incredibly dedicated advocate for the Rogers/Millhouse community, over 8 years ago. At the time I was attending one of my first Council meetings. Fred Battle, then President of the local NAACP (and member of the Hank Anderson Breakfast Club), had presented a compelling case for extending sewer and water to the Rogers Road community on the basis of promises made by Chapel Hill’s Mayor Lee decades before. The community had been told that if they accepted the landfills, the County and the Town would provide mitigations, including proper sanitation and potable water, to offset those burdens. 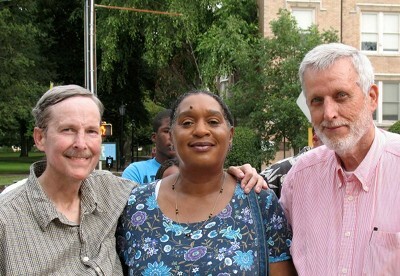 I was moved by Fred’s and Robert’s words that evening, wished I could lend a helping hand. I introduced myself, apologized that as a longtime resident and part of the problem I had not known of their plight and done more to help. Luckily I’ve since had an opportunity to make amends. The last 4 years Robert, Neloa Jones and many of other other folks working to lift the burden off of this community have set an example that I strive to follow. It is a true welcoming gift that they’ve invited my service on their behalf. Unfortunately, eight years on, we are still dealing with some of the same issues. The Council this Spring pledged to form a working group to resolve this long owed debt but that pledge, like Mayor Lee’s of decades ago and Mayor Foy’s of this Spring, remains unkept. Robert wrote this stirring endorsement of my candidacy which appeared in the Chapel Hill Herald and at the IndyWeek. Will Raymond is a person that knows the issues and the effect it has on policies making in local government. Will has been and still will advocate for social and environmental justice. Will is one who sees the importance of citizens’ voices and will be the voice of those that are not at the table where decisions are made that affect them. We are at a critical point in planning for our future of our town. Construction will soon begin in a Chapel Hill planning district, a waste transfer station is part of the development which must be addressed. Will Raymond knows our roads, schools, housing and right to basic amenities will be on the minds of citizens. Local and political education, accountability, honesty and democracy are the keys to transparency in government. A vote for Will Raymond is a vote for Green initiative and sustainability. We need new vision on the town board. Make the right decision and vote for Will Raymond, a man that sees from within and not from without, one who has been at the meeting and has seen and heard the voice of the people. I, Robert Campbell, call for all friends, family members, church members, citizens and veterans to vote for community service and experience. Vote for Will Raymond. Big thanks to the Anderson-Thorpe Breakfast Club for endorsing my candidacy for Town Council. More on my campaign website. Beginning to get some of the crime statistics I requested 11 days ago. I had asked for crime statistics going back 1 year covering Parkside, Northwoods, Vineyard (Weaver Dairy Ext.) and other neighborhoods around the proposed Homestead Rd. IFC men’s shelter. Unfortunately, since I’m not a Council member (as yet) but only a citizen, a bit of patience is required. …number of incidents involving Freedom House, located on New Stateside Drive…According to our records, there were no individuals arrested using the Freedom House as their home address. It is possible that if there were residents of the Freedom House arrested, they gave officers their permanent addresses, much like students do. Below are some statistics our Police Records Division put together regarding incidents in the New Parkside area that were generated for a recent Community Watch meeting. There are a lot of questions (and comments) about the potential relocation of the IFC Men’s Shelter to the corner of Homestead Rd. [MAP]. At last night’s WCHL 1360 candidate forum [MP3] I talked about how, if elected to Council, I would use an approach like the one I helped develop for siting the new Orange County trash transfer station; in conjunction with the community, staff, the IFC and technical experts develop objective, measurable, community and technically based criteria to apply to site approval that complements the Town’s existing planning process. Using a facts based approach should help the community focus on the relevant issues, create a framework for discussion of issues that by their nature are necessarily subjective and reduce some of the tension that has arisen from misinformation (some of which continues to be promulgated). Along those lines, I have requested crime statistics for the Homestead area for the last year, as many of the emails candidates and Council are receiving refer to incidents I wasn’t aware of (not reported in the press, by staff to Council, etc.). Based on these citizen emails, it appears that this area is already having difficulties that are not being adequately addressed. Until I get the statistics, here’s a great tool that the Daily Tar Heel’s Sara Gregory developed for visualizing incidents. 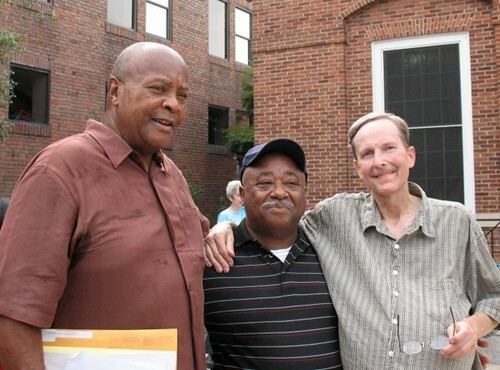 The IFC, local congregations and our various partners request that the Chapel Hill Town Council move forward with the Special Use Permit process and next steps to make Community House’s relocation a reality for the men that look to the IFC for support and new opportunities for regaining their independence. They’ve waited long enough!